SUMMARY: As a child’s swing progresses, parents must remember that learning the fundamentals and developing quicker swing speeds should come before power. The 2018 Easton S650 is a cost-effective USA youth baseball bat that focuses on establishing the foundation and the speed of a youth players swing. As a part of Easton’s Speed Brigade Series, this USA Bat offers an extremely lightweight design yet has the potential to be very powerful. The S650 comes with a single piece aluminum construction composed of Easton’s 7050 aircraft grade alloy delivering faster swings and an enhanced sweet spot. The handle comes prewrapped with a tacky grip giving way to greater comfort and control. Lastly, this youth baseball bat features a spoked end cap providing hitters with stronger durability and increased balance. 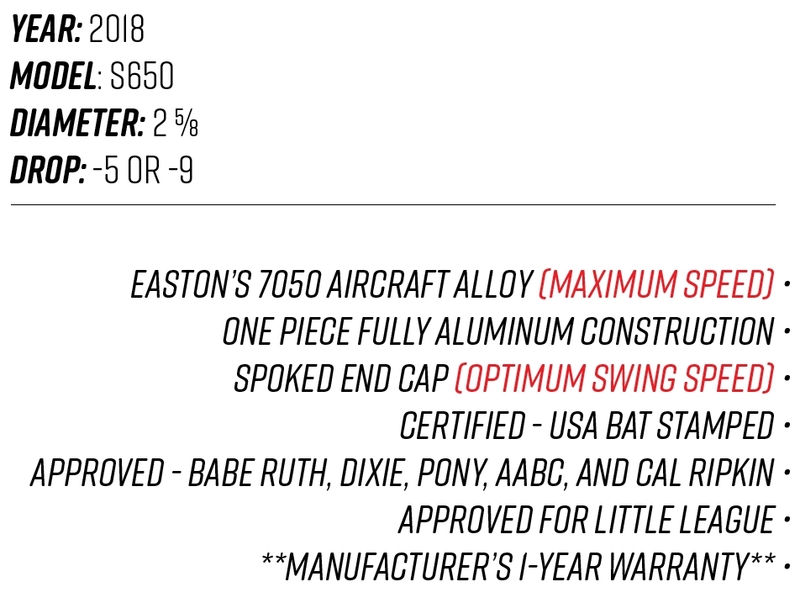 If you are in the market for a USA youth bat that focuses on speed yet you don’t hundreds of dollars to spend, 2018 Easton S650 USA youth baseball bat is a premium option. OUR REVIEW: In reviewing the Easton S650, we reserved it for players 9 years old or younger along with others who have been playing less than two full seasons. The S650 USA youth bat was specifically designed to assist those players in younger divisions in getting ready to use heavier Easton youth bats like the Ghost X or the Beast X. Please note, we recommend this bat to players younger than the age 9. We highly recommend this bats for parents who have their children try baseball for the first time between the ages of 7-9. The price is much cheaper than most USA bats and if your child doesn’t take to the sport, you aren’t out a few hundred bucks. After a little less than 250 swings, below is our official review of the 2018 Easton S650 youth baseball bat. POP: The 2018 Easton S650 didn’t harness the pop and distance of the other Easton USA bats, however it does deliver adequate power for the appropriate younger divisions of youth baseball. Remember that this bat emphasizes speed, balance, comfort, and teaching mechanics over pop and power. The S650 delivered solid shots for sure, but mainly lacked the distance as anticipated. This is a perfect youth baseball bat for coach pitch division or the intro to kid pitch division. VIBRATION CONTROL: When protecting against stinging vibrations during our review, the 2018 Easton S650 didn’t absorb much of the shock from pitches coming through the zone at 55 miles per hour or higher. We do not recommend using this USA youth bat in baseball games where hitters see pitches traveling that quickly. For the appropriate age level, the S650 can definitely withstand the vibrations of younger divisions in youth baseball. Our volunteers under the age of 8 who swung the S650 at lower pitch speeds experienced minimal stings. DURABILITY: Judging the durability of the S650 proved to be difficult. Although this youth baseball bat did endure less than 150 solid swings, the pitch velocities never exceeded speeds of around 50 miles per hour. The youth bat held up well, however we feel that 150 hits wasn’t enough to properly gauge its durability. So after we finished evaluating, we decided to do some more testing. By enduring over another 100 swings, the S650 shows definite signs of use however no dents, crack, or dings. OVERALL EXPERIENCE: As stated before, we recommend the 2018 Easton S650 for youth baseball players under the age of 9 playing in divisions that delivers slower pitching speeds. Our evaluation showed that this USA youth bat is a great one for kids just starting in youth baseball. Buy Your 2018 Easton S650 Drop -9 USA Bat Now! Buy Your 2018 Easton S650 Drop -5 USA Bat Now!